2017 was a year that was filled with emotions on many levels and for many reasons. Some good and some not so good. In September, my friend Helen, who was only a year older than me, lost her battle with cancer – she was such an amazing person, one who was kind, thoughtful and never had a bad word about anybody. Another one of my friends has been fighting this battle for over three years, and has had numerous operations, chemotherapy and anxious times waiting for results. I admire her strength and positivity she has shown for so long during this battle. This year I wanted to achieve something that was way out of my comfort zone, and so I decided to take on the Just Walk event in May – to walk 35km in one day, and raise money for Bowel Cancer UK and Beating Bowel Cancer at the same time. Well - what a great day Claire and I had on our Just Walk 2018 day at Goodwood Races on 12 May. Everyone we met had a wonderful story to tell and it didn’t matter what walk length you did or Charity you supported, everyone was there for a challenge. The weather was a bit chilly but dry to start with at 7.30am, warming up later in the morning. 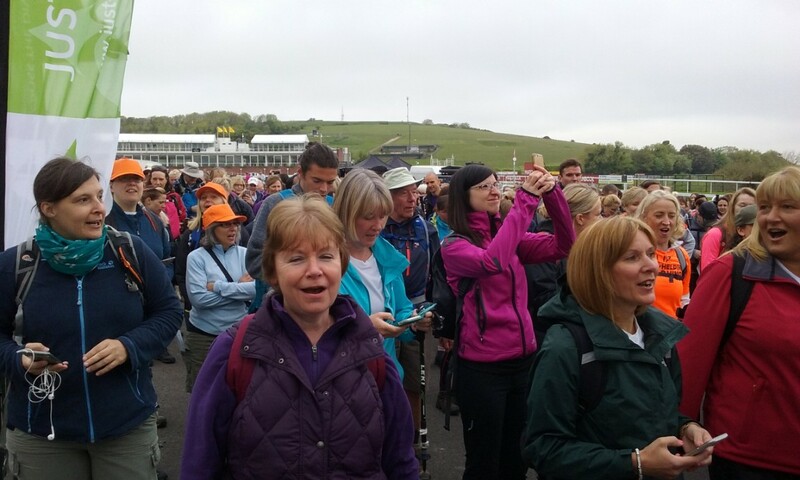 We set off with at a couple of hundred people marching down the side of the racecourse and out into the countryside with wonderful views across the South Downs. The atmosphere was great fun with everyone full of energy and laughter. Power stops were available along the way stopping at an old cricket club pavilion for packed lunches and water stops. The 35kms walkers which included us, continued along the lengthy slow climbs towards picturesque views and through pretty woodland full of bluebells along footpaths. Half way was our lunchbreak which was gratefully received and how our legs appreciated the break. But not for long – keeping moving was the key! Then the heavens decided to open for the next three hours with short breaks to dry out a little. This didn’t deter the determination to complete this challenge as quickly as possible. Marching out when going downhill was a bonus and helped us to keep our pace up. The last 3 kms were hard work. 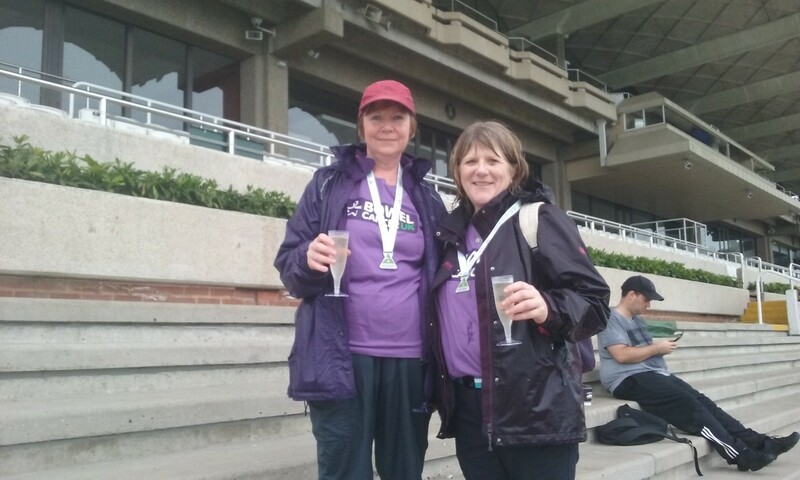 We were wet and tired with aching limbs but that glass of bubbly waiting for us at the end was in sight. Walking back onto the racecourse 8 hours later feeling a great sense of achievement and all the money we have raised for Bowel Cancer UK and Beating Bowel Cancer is a feeling we won’t forget – it was worth every effort our feet made and we thank everyone who has donated or will donate in the future. My goal is to raise £2,000 which would be an amazing achievement – and so far we have raised over £1,700! 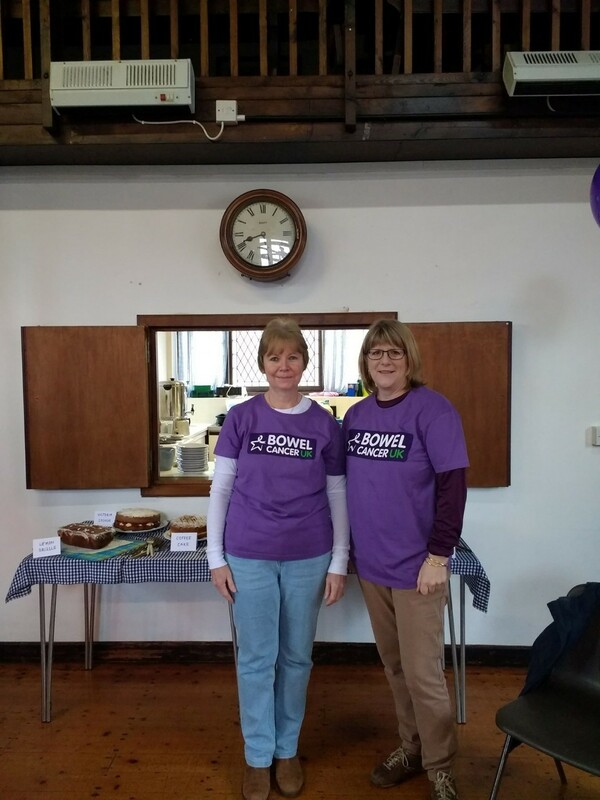 We also held a coffee morning at the end of April and raised £535 which was fantastic!